NAMM 2014: Definitely one of the coolest and most iconic signature models we've seen emerge this year, the Fender Custom Shop Nile Rodgers Hitmaker Stratocaster replicates the Chic man's most trusted six-string companion - his much-loved 1960 Strat. The original has played on smashes for everyone from David Bowie to Daft Punk and the Custom Shop version aims to capture some of that Hitmaker spirit. Check out the full press release below from Fender to find out about the original guitar - and what you can expect from the new Custom Shop model. SCOTTSDALE, Ariz. (Jan. 23, 2014) — The Fender Custom Shop is proud to introduce the limited edition Nile Rodgers Hitmaker Stratocaster guitar. It's a very special recreation of the "Hitmaker"—the well-worn 1960 Stratocaster played by Chic co-founder and revered session ace Rodgers on countless chart-topping songs. Many might not recognize the name, but make no mistake—the sounds of Nile Rodgers and the Hitmaker are virtually inescapable. As a guitarist, producer, composer and arranger, his sales have topped more than 100 million albums over a career now in its sixth decade, and hardly a day goes by when you don't hear music to which he has contributed in some invaluable way, very often with the Hitmaker in hand. He wrote the book on disco/R&B guitar in the late 1970s with Chic and Sister Sledge, propelling both acts to the top of the charts with unerringly radio-friendly musicianship, songwriting and production chops. A torrent of innumerable session, writing, production and film music credits commenced in the 1980s and continues today, with Rodgers making essential contributions to work by David Bowie (Let's Dance, 1983), Dianna Ross (Diana, 1980), Debbie Harry (Koo Koo, 1981), Duran Duran ("The Reflex" and "The Wild Boys," 1984; Notorious, 1986), Madonna (Like a Virgin, 1984), INXS ("Original Sin," 1983), Robert Plant (The Honeydrippers: Volume One, 1984), Jeff Beck (Flash, 1985), Thompson Twins (Here's to Future Days, 1985), Mick Jagger (She's the Boss, 1985), Al Jarreau (L is For Lover, 1986), Steve Winwood (Back in the High Life, 1986), B-52's (Cosmic Thing, 1989), the Vaughan Brothers (Family Style, 1990), Michael Jackson ("Money," 1995) and many others. More recently, Rodgers and the Hitmaker contributed to 2013 hit albums True by Avicii and Random Access Memories by Daft Punk, including the latter's multi-platinum hit, "Get Lucky." Rodgers' affectionately nicknamed Hitmaker is a 1960 Stratocaster with a 1959 neck. He got it for a trade-in long ago at a small shop in Miami Beach, Fla. Exceptionally light in weight; it has a maple fingerboard and bears a well-worn white finish. Rodgers says it doesn't sound like any other Stratocaster in the world. 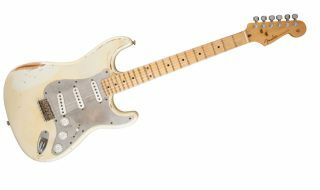 The Fender Custom Shop Nile Rodgers Hitmaker Stratocaster features a light alder body and one-piece straight-grain maple neck, with a 9.5"-radius maple fingerboard, 21 6105 frets, three Custom Shop 1969 single-coil Stratocaster pickups, five-way switching, chrome-plated brass pickguard, three white "speed" knobs, vintage-style hard-tail bridge, locking Sperzel® tuners and a worn Relic® lacquer finish in Olympic White.